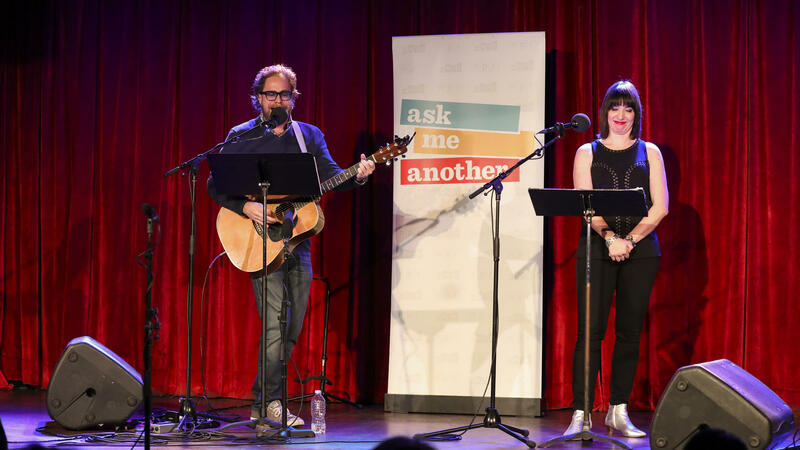 House musician Jonathan Coulton leads a music parody game, alongside Ophira Eisenberg, on Ask Me Another at the Bell House in Brooklyn, New York. In this music parody game, classic rock songs are rewritten to be about what colleges refer to as "Classics." Warning: This game rocks harder than Medusa's victims. Heard on Bob The Drag Queen And Monét X Change: Some Tea, Some Shade. EISENBERG: OK, tell me more about that. BIGGART: I love Aristotle because we're both super type A, you know, because Socrates said the unexamined life is not worth living. But Aristotle said the unplanned life is not worth examining. And I really respond to that. That really speaks to me. EISENBERG: So you're trying to plan your life. EISENBERG: Sam, you also have a side business making natural products, and you make your own reusable wax wrap. I do - and chapstick and shampoo and deodorant and all sorts of things, yeah. Do you keep bees? SAM RUSSELL: No, but I do have a friend who does, and I get beeswax from her. EISENBERG: OK, yeah. OK - didn't really expect that. EISENBERG: Very good. This is a music parody game called Classics On Classics. JONATHAN COULTON: We rewrote classic rock songs to make them about what colleges refer to as classics. So people who majored in classics, this is your one-and-only-chance to shine. COULTON: Just ring in to identify what I'm singing about. And if you get that right for a bonus point, you can name the original song or the artist who made it famous. EISENBERG: Darren, stay in the lead, and you're in the final round. Sam, you need to get more points, or you'll have to translate this show into the dead language of your choice - Latin or cursive. EISENBERG: I know it's sad - sad but true. COULTON: Here we go. (Singing, playing guitar) He was a mythic king. It was a tragic thing - fulfilled a prophecy about the sorrow he'd bring, gouged out his eye when he realized he killed his dad and married his mom, who then dies. COULTON: For a bonus points, can you name the original song or the artist? COULTON: That was "Shook Me All Night Long" by AC/DC. COULTON: Stoicism is the answer. That's what we're looking for. COULTON: And, Darren, for a bonus point, can you name the original song or artist? BIGGART: I maxed out with stoicism. So I'm sorry. COULTON: He's still overwhelmed by that situation. That's was "Me & Bobby McGee." (Singing, playing guitar) Well, there's a temple. There's a statue. There's a lighthouse, a second statue. Pyramids still here today. There's some gardens, a mausoleum. It's too bad you can't see them. Six of them have gone away. BIGGART: The Seven Wonders of the World. BIGGART: I feel like I can sing some of it, but I can't get there. COULTON: I can sing a little bit of it too. BIGGART: Yeah, you sounded great. COULTON: That was "The Joker" by Steve Miller Band. Here's your next one. (Singing, playing guitar) Latin words are so passe. With Italian, I did convey hell and heaven, purgatory - don't sound much like a comedy. RUSSELL: Is it "Dante's Inferno." COULTON: Yeah, you got it. COULTON: Can you name the song or the artist? RUSSELL: That's about as good as my karaoke gets too, so, no, I can't name it. COULTON: So close, so close. COULTON: You're gonna be kicking yourself, Sam. RUSSELL: I have been all night. RUSSELL: The Hippocratic oath. Yeah, that's right - Hippocrates. RUSSELL: And I know it. COULTON: Bonus point for the song or artist. RUSSELL: "I Love Rock And Roll." COULTON: Yeah, that's right - Joan Jett. EISENBERG: Well done, the two of you - that was a hard game, and you did great. Congratulations. And after two games, Darren is moving on to our final round.